Lady Máirghréad Ghearr first began attending Barren Sands War 2001, then attended a few Pennsics, became active in SCA with the Barony of Carillion in January 2007. 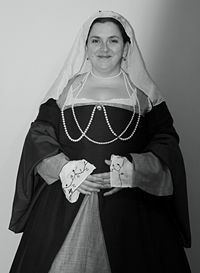 Máirghréad is currently focusing on the Tudor era. Former apprenticed to Mistress Kis Maria, Baroness of Carillion April 2009 to January 2012. Order of the Lady of the Fishes (2009) & The 4 Ladies of the Apocalypse (Oct 2010) inducted by his Excellency Lord Cosimo de Signorelli Baron of Carillion (Cosmo of Carillion)R.I.P. This page was last edited on 10 March 2019, at 17:15.